The Commission on Teacher Credentialing (CTC) developed standards for the California Subject Examinations Test (CSET) based upon judgements and recommendations of California Educators. Together they developed a standard for each subject matter by which all of the CSET examinations are measured against. Prospective educators that wish to teach Music will be required to take the CSET Music examination which is comprised of three subtests. 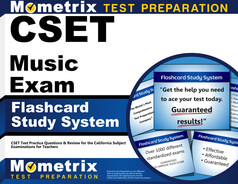 Use the CSET Music practice test to prepare for all parts of the examination. CSET Music test #136 will test your knowledge with 45 multiple choice questions in the subject areas of Artistic Perception Historical and Cultural Foundations, and Aesthetic Valuing. The second part of the examination is CSET Music subtest #137, which has 40 multiple choice questions on Creative Expression and Connections, Relationships, and Applications. The third part of the examination is CSET subtest #138 consists of 40 multiple choice questions on Music, Methodology and Repertoire. In addition to the multiple choice questions, your test will ask 5 constructed response questions, where you will be presented with some material and you will need to provide a short, focused response. Keep these subject areas in mind when you study using the CSET Music practice questions. The testing center will provide a response sheet for your answers. This is a computer based program that will provide a tutorial on how to upload the response sheet. Once you have registered for the examination, you will receive a materials packet in the mail. The materials in the packet will provide the parameters for creating 2 videos—one will be a demonstration on an acoustic piano and the other will either be an acapella vocal selection in Italian or an instrumental piece. You will be given 2 hours and 15 minutes to complete test #136, 1 hour for test #137, and 1 hour and 45 minutes for test #138. You will be able to receive your test results within 7 weeks. In order to be certified to teach Music, you will need to get a score of 220. Mometrix Academy is a completely free resource provided by Mometrix Test Preparation. If you benefit from our efforts here, check out our premium quality CSET Music study guide to take your studying to the next level. 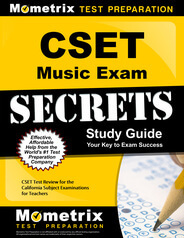 Just click the CSET Music study guide link below. Your purchase also helps us make even more great, free content for test-takers.